Yay Cross Country Day! Right? Right! Except…. we left the barn at 6:30AM to make my trainer’s ride time and… it rained most of our drive. I anxiously watched the weather report, and that wasn’t looking promising either. My 3:46PM ride time was right smack in the peak of the anticipated thunderstorms. Plus, if there were lightning delays, we might run out of sunlight before my division could run. UGH UGH. No matter what though, our team would not be deterred! We all hopped out of the truck and hustled to get my trainer on. It was super fun watching the Prelim and Training level riders go out and come back on course. Although, I was kind of shocked at how many of them were going out in muddy, hilly conditions without breastplates on. Is this a thing? Let me know. Things wrapped up pretty early, and the sun started to come out. We have a few hours until the BN riders had their rounds (around 2PM), so we got the horses all settled with hay and water and then grabbed some lunch. Honestly, those few hours were BEAUTIFUL. After lunch, we decided to walk the course again with our trainer, since we had walked it on Saturday night without her. There were very few things to talk about on the Starter course, but we did have a short discussion about the water complex for starter. I really should have gone back and read the rule book about it. The water complex was marked S1, but the flags were snugged up around the water with no way to go around it. Numbers and Letters – Each obstacle shall be numbered. Obstacles with elements or options (see EV140.2) shall in addition be lettered (A, B, C, etc.). Each compulsory passage shall be marked with the first letter of the level and numbered consecutively. ERRORS OF COURSE. All compulsory passages and all obstacles, including all elements and/or options, must be passed or jumped in order, under penalty of elimination. However… I couldn’t find anything about if you can even get a refusal in a compulsory passage? I wish I had known the answer, because if it was no (which I think it is), then I would have schooled the water. Oh well. More on that later. I figured I would throw the pics of the whole course below, so you can see it in SUNLIGHT. You know, the way I saw it before I left the startbox. Around 1:15PM… it started to thunderstorm and BAD. We all ended up huddled in the dressing room of the trailer with the door closed because it was raining sideways. At this point, I texted the husband and told him not to try and come. The last thing I wanted was him spending nearly 3 hours in the car on a Sunday, driving through torrential rain, to see me NOT ride. The radar looked miserable and only one BN rider had gone out at that point. Luckily, there was only one round of lightning delays. Once it was lifted, everyone moved quickly to get the BN riders out and on course before weather could roll in again. At this point, I have to give so much credit to the organizers, volunteers, and competitors at this competition. Everyone HUSTLED, but there was NO chaos. Riders showed up in warm-up, got their place in line (seemed to be 4 – 6 horses out), got warmed up, and went. No one complained, got angry, or even seemed all that frazzled. The footing though… was pretty shot. As a result, there were a lot of refusals and a few eliminations, so I was rethinking my plan. Once our BN riders were done, I looked around and realized that they seemed to be almost done with BN, so I hustled back to the trailer and threw tack on May. How quickly did I get ready? I put my riding pants on OVER the leggings I was wearing, and I wore my trainer’s C4 belt because I couldn’t find mine. We power walked up to the XC area, and I felt my little fear bird show up. Yes – I picture my fear as a little baby chick. The mud was deep. My horse is barefoot. The course was soft and easy for her but I don’t think I have ever ridden this horse in conditions like this. Then, I walked my way through my fear. The truth is, I spent my younger teen years hunter pacing very green horses over WHATEVER in the Spring and Fall in NY/NJ. We never used studs, and I had definitely ridden in worse weather. I just needed to take my time, ride the rhythm, and keep May’s hind end under her. I warmed up on the flat as quickly as possible, since the footing in warm-up was fetlock deep mud at this point. NT advised me to pop over the crossrail… and I told her I couldn’t. the takeoff and landing for the crossrail was pretty much gone. Deep skid marks crisscrossed through the mud on both sides and at all angles. We decided to just pop over the small coop and then the log. May was ON her game and taking me to the fences, despite the footing. I felt good, so we headed to the start gate. On the way to the start gate, someone commented to me that my horse looked totally unfazed by the footing and was definitely a mudder. I couldn’t agree more. Then… as we were standing by the start gate, the water flag conversation came up again. I guess people weren’t going through the compulsory crossing by the water. We were coming up with a plan for it (i.e. just go through the flags no matter what), and then all of sudden I got the “5, 4, 3, 2, 1” countdown… and I was probably 20′ from the actual box. DAMN! I pulled May around, trotted into the box. Stopped, set my watch, and went! Jump one rode great, but she quickly fell right on me. We had a discussion about NOT doing that… and then she did it again at jump 2. I guess the starter jumps were too easy, so she needed to add her own level of difficulty. Jump three was a VERY small jump, but it was off a tight left hand turn. It also had a steep hill right after it that crossed over both the BN and Novice paths from earlier in the day. Since I wasn’t sure about the footing there and the jump was so small, I trotted the turn and kept May in a collected canter over it. We swept down the hill to the brush at 4. There’s a picture of this somewhere… I didn’t totally get our rhythm back by it, and I didn’t want to make any big moves in this footing. As a result, it rode pretty awkward. Oh well, May could care less. Jump 5 was a little roll top on the hill. May was looking back at the warm up and we jumped it weird. Oops. Jump 6 was shared with BN, but they took the brush off the top for us. It was a bright blue roll top that rode GREAT. Jump 7 was a little oxer thing. By this point, we were getting into a rhythm. The rhythm was simple. Pitter patter canter on the long stretches. Then, I would pick her up and get her moving forward maybe 8 strides before the fence. Then land and back to pitter patter. We had SEVEN minutes to finish this course, so I was in ZERO rush. Jump 8 was a little red coop that she jumped great… with her eyes mostly closed. Jump 8 was a cute little cabin going downhill. I kept her canter super collected so that we didn’t launch ourselves down the hill in the mud. After Jump 9 was the water crossing. As I got closer, I saw that the flags had been moved so that you could go around the water. Again, I wasn’t sure about the rules here, so I went around the water but through the flags. May took a hard look at it, since it was now deep, dirty, and a bit slick, but she went through. At this point, I had 3 jumps left in a mostly straight line, and I had a 4:15 on my watch. The penalty time was 5:00, so I decided to grab a quick trot circle. (Of course, now I realize my watch was slightly behind but whatever). Either way, I am glad I did because it led to some cute pics (PC: Vic’s Pics). After wasting maybe 30 seconds, I continued on. Jump 10 was tiny. like TINY, so that was fine. Jump 11 was a cute little saddle rack. Then, it was over the last, through the flags, and within time! Neither May nor I was at all winded, but it was just starting to rain again. While I chatted with my teammates a bit, May got to walking around. I saw the girl in 1st place coming through the finish line after me. It was a junior rider, who was just BEAMING ear to ear. I congratulated her on a good weekend before walking my own pony back to the trailer. Nice course map. I still got lost between 11 and 12. It was then a straight shot to jump 2, which was at least more interesting. You can see the SJ warmup just to the right here. The start gate to the top left was for N and BN. After jump 4, we cantered along the “galloping lane” which ran next to the warm-up for SJ and jumped 5 and 6 in the fenceline. We had another steep downhill. to jump 7, where May took a GOOD look at the bright gravel behind it. The gravel doesn’t look like anything in this pic, but it was a lot more apparent in the helmet cam. Jump 8 was a bit narrow and uphill, and led right up to jump 9, which was wider but a bit spooky going into the woods. I thought it was nice to have a clear bending line at Starter. We then went back down hill and up again to jump 10. I trotted down this hill to make sure we kept our line and didn’t risk slipping. Hills are always steeper in real life than they appear in pictures. We had some time before jump 11, which really wasn’t an issue. Interesting they put bright shavings in the middle of a dark bench. Oh well, May didn’t care. Jump 12 was apparently set for another division when I walked the course, which made me sad because it looked fun set a bit higher. You can see the flags for other divisions jumping this in the opposite direction. Then… the water. One of the reasons why I wanted to do this event, and why I wanted to do it at Starter, is because this event has a pretty spooky water complex. It is mostly in the shade (by the time I rode), it has a lot of jumps surrounding it, and the entrance is very narrow and away from the barns. The entrance was to the right of this red roll top, which was away from the barn and a bit narrow. You can just BARELY see the green and white Starter flag ALL the way to the right. The sun went behind the clouds for our ride, so I think this gives you a better idea of what the water looked like during our course. Dark, a bit claustrophobic, which a tight entrance that was tough to get straight to. Jump 14 was a small bank going uphill, which was fun. Right after Jump 14 I checked my watch. Optimum time was 5:18 with speed penalties being below 3:20. I was sitting at just under 4 minutes, so no worries there. I had WAY too much fun just kicking on to the last 2 jumps, and the jump judge at the end definitely got a kick out of me whooping along. We left the woods and went into an open field where the last two jumps were. Jumps 15 and 16 were fairly straight forward, with more stuff sitting in the bench of jump 15. Again, random junk in the bench. Sorry for the terrible pic. The sun was wild early in the morning. So how did it go? See below! When all was said and done, the person in 2nd ended up with a few time penalties, and we moved up to finish 2nd out of 17! Super proud of wonder mare. She was… less than impressed with the whole thing and, as soon as she was cooled down, went back to napping by the trailer. May was seriously suspicious of the white gravel anytime we came across it, and looking at the video, I am really not surprised. It’s got to be pretty hard for a horse to read. Not a big deal though, and she was super game over all the fences. We ended up doing the water. She sucked ALL THE WAY back to the walk, but she didn’t stop, back up, or go sideways. She got lots of pats and loose reins in the water. Until I had to steer away from where I knew a drainage pipe was hidden. We ended up finishing with a time around 4:25, although the video below clocks in at 4:20. Either way, well within both time limits. It is probably fair to say that about 90% of people do eventing because of cross country. It is just… fun. May and I had gone xc schooling once since moving to KY, and we hadn’t really done a full XC course since our last horse trial. Again, due to the late start, we didn’t get a chance to walk the course ahead of time. Luckily, most of the jumps were visible from either the Dressage arena or the SJ area. There were 13 efforts in total. I didn’t wear a watch, so I have 0 idea how long it took us. Jump 2 was a bit downhill, so again, I had a conversation with May about how that was not permission to fall flat on her face. Either way, we were up and over it. You can see us trotting at the end of the clip, as I tried to find my way to jump 3. Jump 3 was a small down bank, but it was in line with a bunch of other banks through the trees. Of course, I lined up with the larger bank that we had schooled the other week, so I had to correct my course. Either way, May dropped down like a rockstar. Immediately after jump 3 was the water. The water was flagged generously, so you could go around it on the left. I took that option, since I didn’t have enough time to land off the bank, get May squared up to the water, and create impulsion towards the water. Either way, May bent her body so far away from the water that we almost missed our flags. I galloped to the end of the field, looking for the only jump on course I hadn’t been able to find when I was scoping things out. It was described as a “stack of logs.” Cool, I thought, it will just be a little pyramid of logs on the ground. No big deal. The approach was a bit odd, as the fence line kind of curved away from the jump and then back to it. I managed to find it on google maps, so you all can see what I mean! Of course, what I didn’t anticipate, was that the “stack of logs” wouldn’t be sitting on the ground. They were actually raised about a foot off the ground, making this both a bit of a looky jump, and the biggest jump on course. Cool. I didn’t look at it too long, just found my line, looked up, and kicked. May popped over it beautifully. We had a bit of a gallop to fence 7… which I honestly can’t even remember. I am pretty sure it was just a small, brown coop. Then… I got a bit lost… I almost jumped the BN number 8, before I found my number 8. It looked tiny, so I cantered over to it. As I came upon it though, I realized why it looked so tiny. It was at the bottom of a very steep, short hill. Maybe two strides down the hill to the log. May could care less, and we were over. We came back through the woods to number 9. Jump 9 was a cute, baby roll top. However, you can see May land and start drifting back toward the trailers (towards the camera.) Our approach to jump 10 was a bit crooked, and then we had to re-balance, turn left, and go down hill to jump 11. As a result, we had a bit of an argument over jump 10, and a not-so-flattering moment. Oh well. It was fine. Jump 11 and 12 jumped great, and we had a nice stretch uphill to jump 13, so I asked May to give me a bit of a gallop. She did, and I got lots of compliments from people after about how much fun our course looked. Jump 13 was the last jump. It was a cute train jump, which May popped over, and then got lots and lots of pats for. 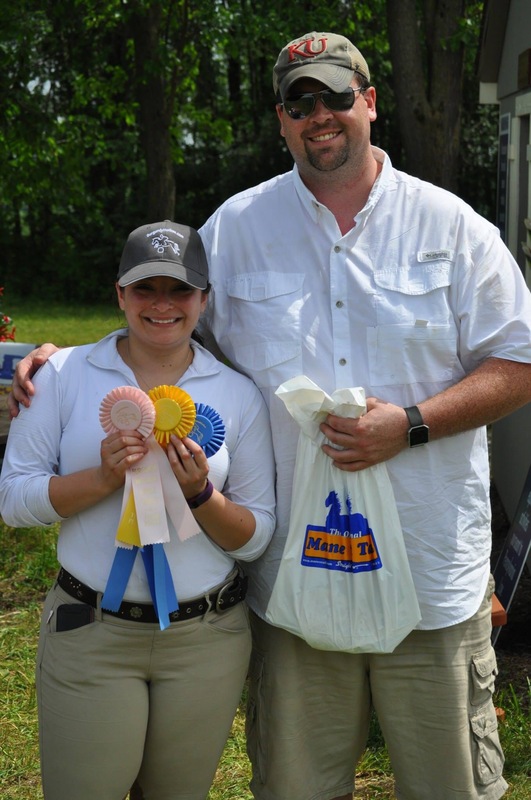 The event still had several hours to go, and the barn was only 10 minutes away. I decided it would be best to cool May off, take her home, and then come back for the final results. (especially since May decided that any of the water presented to her at the show was poison.) May hopped back onto the trailer and was all settled in at home again within an hour. 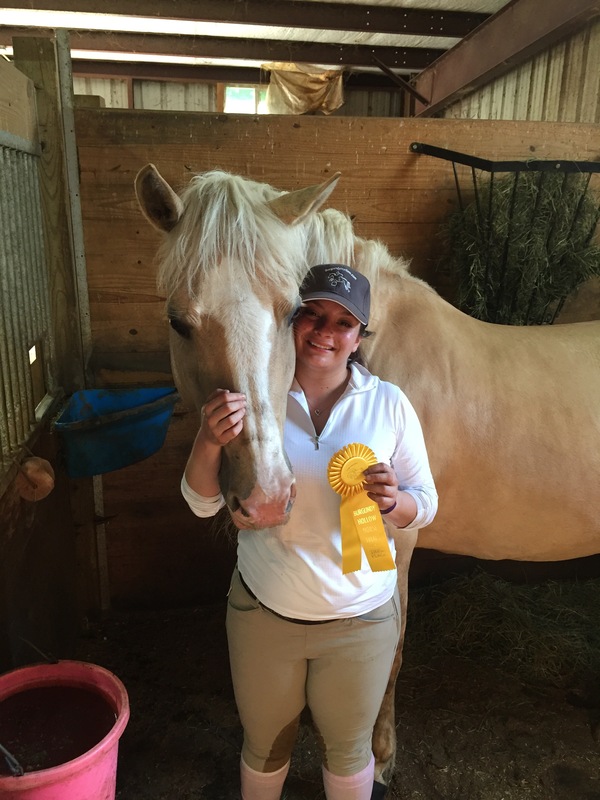 I drank lots of water, and we headed back to the show for, hopefully, a ribbon. This year I finally had the opportunity to dip my toe into the ocean that is the Rolex 3 day event at the Kentucky Horse Park and attend the XC day. Originally, we didn’t buy tickets because I was somehow under the impression that it was the same weekend as the tasting for my wedding. Thanks to an ad in COTH. I realized the day after the early-bird special pricing that it was, in fact, the weekend after. HOORAY! We bought tickets that night as both an early and a late birthday present for me! There is a huge difference between watching Rolex on TV and being there in person. Having a horse gallop past you at full speed towards a jump that you can’t even see over is awe-inspiring and thrilling. Even the fiance had to admit it was a pretty cool sport to spectate at. There was A LOT of walking involved. Between wanting to check out all the things for sale, getting food, and wanting to see as many of the jumps as possible, we walked a lot. The first thing we did because we got there so early was check out the shops set up. I visited a friend of mine I haven’t seen in YEARS at the Bit of Britain tent, which I think is part of the magic of Rolex. It’s like a pilgrimage for eventers. I ended up getting an ariat sun shirt, an ariat long sleeved quarter zip, an US Eventing polo, and a Rolex 3 Day baseball cap. Dublin Pinnacle boots in black – I have seen pictures of these boots everywhere. I briefly considered getting them, but the pictures made them look clunky and the price point made me question how well they were made. Seeing them in person changed that. They were absolutely lovely. The laces up the side give them a close fitting feel that again, I really just wasn’t expecting. Definitely adding these to the list! Saddles – I wish I could put one brand in here that I was like YES THAT ONE, but I can’t. I have seen a lot of French saddles, and I have owned both a Voltaire and a Devoucoux. As a result, I also know that they would never fit a horse built like May. I currently ride in an Albion, which is… ok. It puts me in a bit of a chair seat and the leather is a bit slicker than I would like, but the big blocks give it a secure feel. It mostly fits May, and it was in my budget after I bought her. All good things. However, the fit to her could be better and the fit to me could be MUCH better. I was really drawn to three saddle brands for the trees they offer that could solve my problems: Black Country, County, and Bliss of London. Trying to make an appointment with a local saddle fitter to discuss the Albion and possible other alternatives before calling out a brand-specific rep. Anyone have experiences with these brands? Horses – seriously, how can you not watch riders gallop over massive fences with huge smiles on their faces without wanted a chance to ride on of these awesome athletes? Then I realize that I am not the kind of athlete the riders are, and I am quite satisfied with Miss May. We didn’t bring chairs because I didn’t want to haul them around all day. So at around 11:30AM, we got lunch and headed into the stadium to sit down and watch on the big screen. About 10 minutes later, the skies opened up, but because of where we were sitting, we stayed nice and dry. After lunch, we headed down to the head of the lake. We got a decent spot to watch, and we got to check seeing a person fall off in the water off our list. We stayed just past 1PM to see Kim Severson, Clark Montgomery, and (of course) Michael Jung ride through the head of the lake. Both Kim and Clark looked so solid through the water, and we were crushed to hear the difficulties they had later on course. Thanks to USEF offering free video clips over the rest of the weekend – I got to see the rest of their rides. It really is an education to see these people ride. After Michael Jung, we packed up and headed home. Overall, we spent about 5 hours at the horse park and my head was absolutely spinning. The next day I wasn’t able to watch the show jumping, but I was repeatedly updating the live scores on my phone. (and providing the poor fiance with constant updated and facts and figures) Overall, Michael Jung proved that a good mare is worth her weight in gold. I was also heartened to see the 18yo Mr. Medicott winning the US title and that almost all of the horses in the top 5 were in their teens (Rocana is 12). I guess I shouldn’t be questioning if I should let my 12(ish) year old horse stay at the lower levels. A sound horse is a sound horse, and the longer I am around horses, the more I learn that young does not equal sound and old does not equal lame. 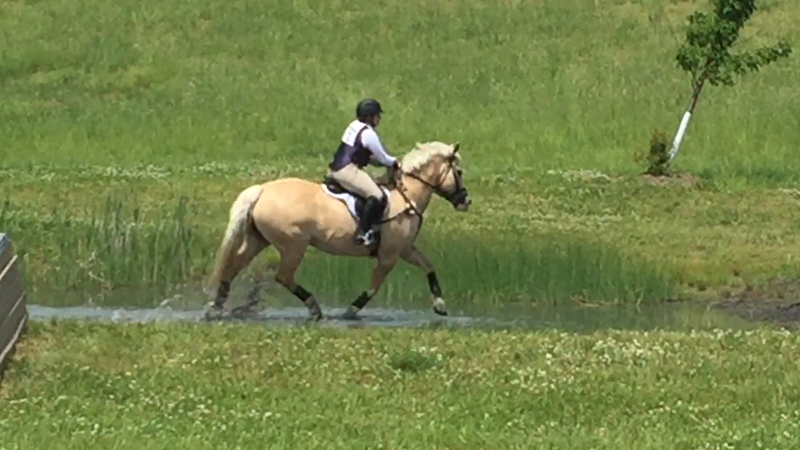 Speaking of May – I rode her this weekend, and she is just barely foot sore. The more time she spent in the forgiving arena footing, the more comfortable she felt. Still taking it easy, but it was nice to be able to put a somewhat normal flat ride on her! If you hadn’t noticed, I didn’t post goals for this show. Mostly because they didn’t change. I still wanted a low 30’s score in Dressage. Again, this show was on grass. It’s a bit hard to get May to show off her trot work on grass because, if she slips, she gets quite disgruntled. I still wanted a clear SJ round, but this goal did get tweaked a bit. I wanted to ride forward, even if it meant we got a rail. Finally for XC, I still wanted to go clear. 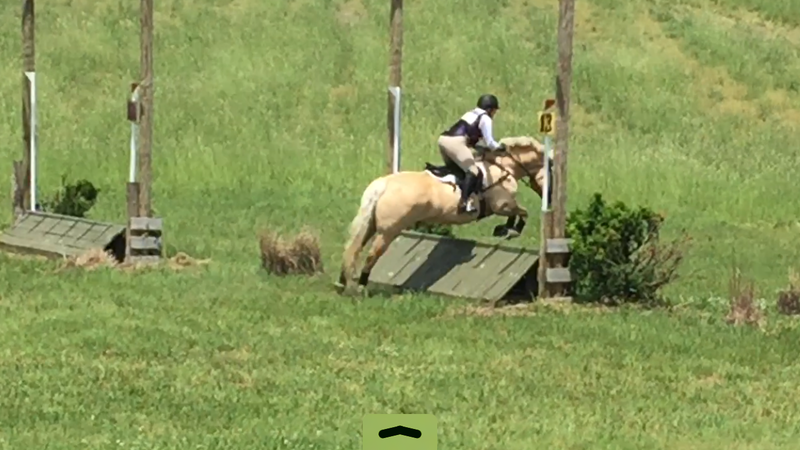 This show had a flagged water complex, a slightly skinny bank, and a true ditch, so even though some of the jumps were undersized, I knew I had to really ride for these obstacles. Our official Dressage time was 11:24AM. We got ready with the other members of our team who had slightly later times and wandered over to the warmup area. We walked around a bit, and I checked in with the ring steward. (do they have different names in eventing? I honestly have no idea). She told me that they were giving some people time where they needed it, but they were running ahead of schedule and I could go in when I was ready. Perfect. 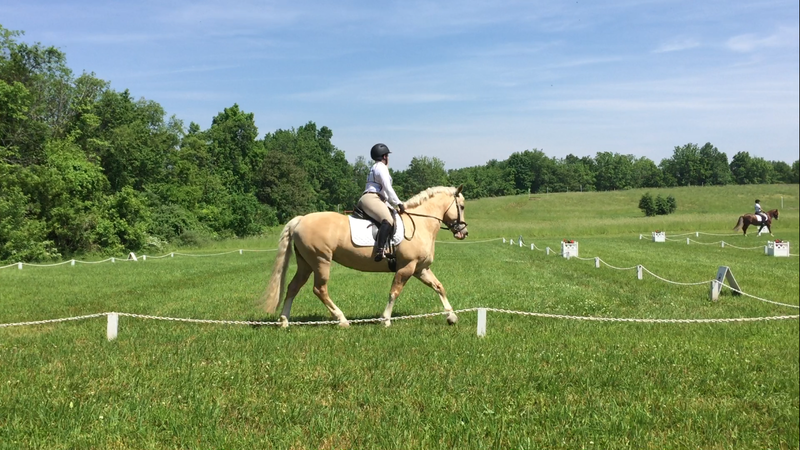 May doesn’t need a lot of work to go into the Dressage ring, and it was hot (about 90 degrees and humid). In an effort to keep the riding to a minimum, I waved over the fiance, who waved over my trainer, and we got warmed up. We did maybe three circles in each directly. May was moving off my leg, but was having some problems falling on her forehand at the canter. This is something we are working on and not something that was going to be fixed in the warmup ring. So with that, we headed in! This show gives you the option of choosing which test to do. While May rides better in BN B, I thought it would be good to switch up the test on her and do A. Of course this meant that as I trotted down centerline, I was seriously debating with myself it it was a right turn or a left turn. I decided it must be left, and it worked out! Our beginning few moves were really nice, and I have to say I am happy with them. The left is where she likes to ignore my inside leg and get stiff, so I am happy with the amount of bend I got through the circle. The canter transition wasn’t great. It was going downhill, and she seemed to disagree with me as I tried to explain that she could pick up an uphill canter while going downhill. She also slipped a bit in the corner, but I do really like the second half of that circle. The walk work was… meh. She got a bit distracted at the beginning of it and never really stretched. The right trot work was solid and about where I can expect it. I can’t let her bend as much in this direction or I lose her shoulder. I managed not to lose her shoulder, but I did have to remind her to come off her forehand. We then had a good amount of time until show jumping, so May go completely untacked and got to hang out and eat grass and hay. I hid in the shade and tried to stay cool, calm and composed. This was my downfall last weekend, sitting and waiting for show jumping.. and thinking. WAY too much thinking. So this time I did every reasonable thing I could think of to avoid thinking about it. Then, it was time to get ready for show jumping and XC. At this show XC would run immediately after the SJ, so we just got ready for both. One of my favorite parts of this show probably makes no sense to any hunter/jumper types out there. The warm up jumps are set on a hill. A steep hill, about halfway up. The great thing about this? I have to kick to get up the hill, so I end up kicking the whole way to the base of the jump. It’s like magic! When we originally walked down to the SJ field, I remember thinking that the jumps looked tiny. And they were, they were set for starter. (damn!) We wandered around a bit as they finished that division and then they put the jumps up. And I remember thinking they still looked small (yay!). They were undersized for BN, but that was exactly what I needed. Overall, the round was good. I was able to have some influence on the spots we took, and we mostly kept a steady, forward pace. I should’ve fixed the lead to the jump on the far side of the ring, but again, my goal was forward. I am ok with the rail. It wasn’t clear, but it was a MUCH better ride than I gave May last week. At this point, I am thrilled with that! Then it was off to XC! Sorry there aren’t pictures of almost every fence like last time. The first fence was a coop a few strides from the start gate. Then up a hill (Burgundy Hollow is basically on one big hill) to a half roll top, then a small gate at the top of the hill. May pretty much jumped me out of the tack over all three of these. She is really getting the hang of her job! And towards one of the larger jumps on the course. A red table on a downward sloping hill. May wanted to look at it so bad that she ended up sneaking it another stride right before it, but she was honest and jumped it. Then down the hill and across the dirt road to the ditch and another up hill. May leaped across the ditch, and we charged up the hill as fast as her corgi legs could take us! Up the hill was a small log and a standard sized bank. The face of the bank was narrow, so we had to steer a bit. May seems to really like banks, so it wasn’t an issue. I just had to make sure she locked onto the right section! There was a hanging log at the top of the hill. Then we started to go down the hill and over a large rolltop. At this jump you started turning back towards all the trailers and other horses, and you were kind of overlooking them from the top of the hill. May got a big wiggly and distracted, but I rode to the base and she jumped. The rest I mostly have video of! She was not coming back like I was asking coming down the hill, so we got an awkward jump over the log. She sucked back going into the water, but did it. Then I had to give her a tap with the stick to get her refocused for number 13. Then we had a drunken gallop to number 14 where she was totally distracted, but honest. 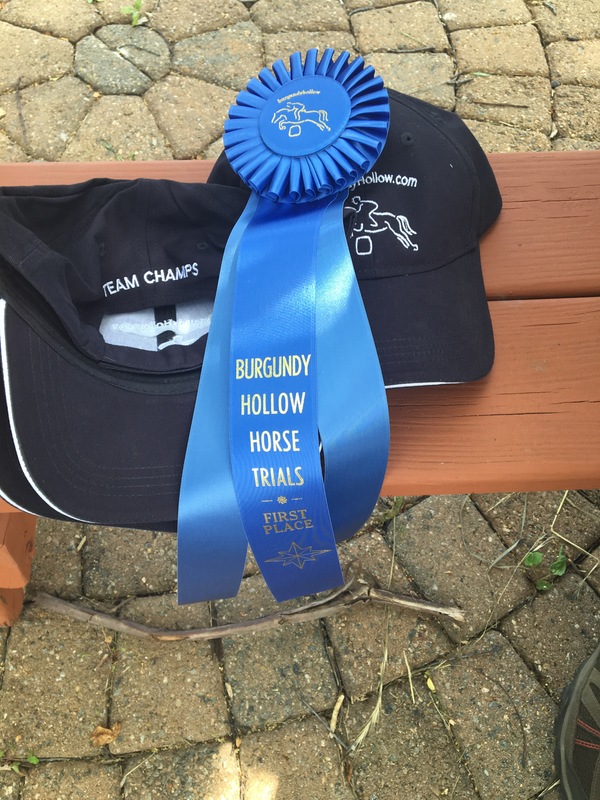 And our barn’s team ended up winning, so we got some great “team champ” hats! My friend also got 5th in her division, so we got to take pictures with satin that wasn’t even ours! Thanks to Mark Hirschfeld Lewis for the Picture! Overall, it was a really fun day where we accomplished our goals. We don’t have another show planned until the fall, as my trainer is having a baby, but we have plenty to work on at home, so stay tuned! I apologize for the fact that it has taken me so long to write a recap of this one. The show itself was a bit of an emotional rollercoaster and my feelings about it are following the same trend. First though, the logistics of the day! So in short, LONG DAY! We actually braided for this show, and I was very impressed with how well May’s braids stayed in, especially considering how unamused she was by them. After convincing her to get on the trailer in the dark, which she was convinced she would never fit in, we were on our way! The morning started out damn and cool, but the forecast promised better weather once we got to the show. For the next three hours, we just hung out. I got to watch my friend ride Dressage and some of the Training level riders jump their SJ. May got to eat lots of hay, which she appreciated. Then, it was time to get ready for Dressage! May stood like a superstar, and I got to wear my new show coat and stock tie! (pre-tied, because ex-hunter-princesses don’t know how to tie a stock tie) I also actually busted out my Dressage saddle and a brand new white pad. Overall, we looked pretty legit. May was great wandering away from the trailer… but then our friend started screaming. May’s response was to scream back and prance up and down the hill by the stadium ring. My response? Sit like a ton of bricks. Fighting with her face was just going to get her more agitated and convince her that this whole thing was a bad idea. So I just sat there and made her go up hill when she wanted to jig. The result? She stood quietly next to the stadium ring after about 10 minutes. I also got to meet Amelia Pitts from Dark Jewel Designs Browbands (check out her awesome stuff here). May is definitely getting one of these once I am less poor! Dressage warmup was a bit tough, as there were probably ~20 horses at any given time also trying to warm up. The hill and slick grass were also a challenge, but May handled the atmosphere well. Our timing got pushed back a bit, so she stood longer than I had planned. Unfortunately, that meant we did lose a bit of focus. I managed to get it back as we trotted over to the ring we would be showing in from the warmup ring… I then waiting 3 minutes for the girl in front of me to finish her salute. So there went that round of attention-getting. After she exited the arena, we did another quick warmup, and May felt really good and on my aids. She wasn’t looking at the busy warm up ring, or the judges cars, or the road right through the trees next to the ring. We then had about 3 hours before stadium. So May went back in the trailer, and we all ate and hung out for a while. My friend went before me in stadium and had a great, clear round! I, however, was starting to think too much. I started to feel pretty nauseous, but I tried to convince myself that it was the hotdog and heat and not the high jumps stuffed very close together in the stadium ring. We got May ready (she looked fantastic with curly hair), and we headed down to the warmup ring. Also with 20 horses in it. It was chaos. They were running 25 – 30 minutes behind schedule, so there were horses there waiting for their rounds and horses that thought they were riding soon but were really really early. We warmed up on the flat, and we jumped some jumps. She moved up to the jumps when I asked, and took the long spots when I asked, but she wasn’t really hunting the jumps like she usually does. She wasn’t taking me and letting me sit and regulate the rhythm. As a result, I was having to create the rhythm, keep the energy moving forward, hold her balance together, try to find distances, and avoid other horses. It was a good warmup, but she just didn’t feel like she was into it. Then we had to go stand. At the in gate. Even writing this now, I feel that blackout kind of felling washing over me again. Not good. May got fidgety, but not in an excited way. I could tell she was feeding off of me a bit. The photographer got a full series of pictures at fence 3. They were not pretty, and the photos are public. Oh well. We trotted into the arena in a bold, confident way. And then May saw all the people standing on the hill above us, and she didn’t take a look at the combination I had us trot through. She got tense and I, like a nervous genius, took my leg off. We got over the first to fences fine, and I started to feel like myself in the tack again. Then, we just missed to the third jump. Everyone was missing it all day, so I knew it would likely be an issue. May dropped behind my leg, and I jumped up her neck. 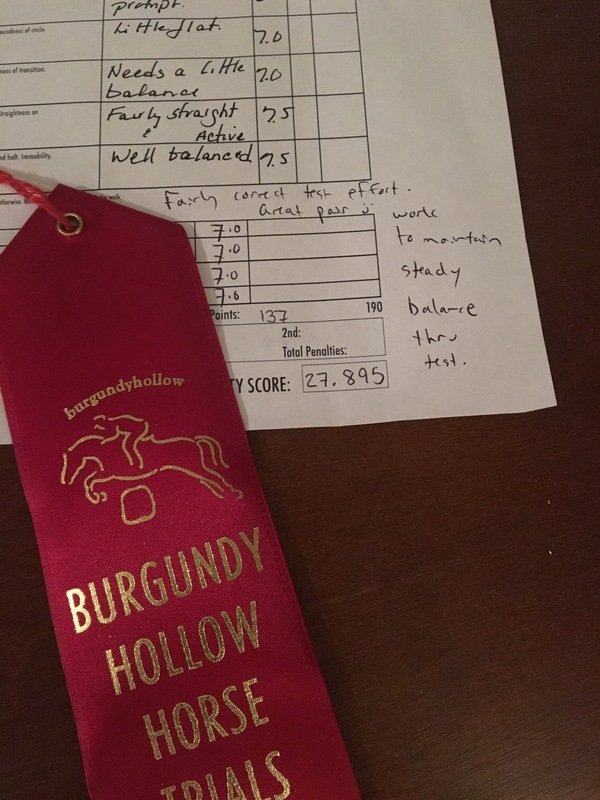 It was ugly and unfair to my horse, and I felt her confidence drop. Of course, the next jump was a big square oxer off a short approach. I got nervous and chased her. She was a good girl and jumped it. We then came around to the combination, and she just sucked back. I tried to kick her through the line, but her balance had already fallen forward and we got 2 and an eighth strides (calling it a quarter or a half a stride would be too generous). By this point, May’s confidence was pretty shot (as was my own). My turn was bad to jump 6, and she decided she didn’t want to jump it. I don’t blame her, by this point, I didn’t really want to jump it either. We circled back, and I was determined to ride forward. And I did. By the last 3 jumps, May was back to being May. She jumped great down the long diagonal like, and did well around the last turn to the bright vertical. 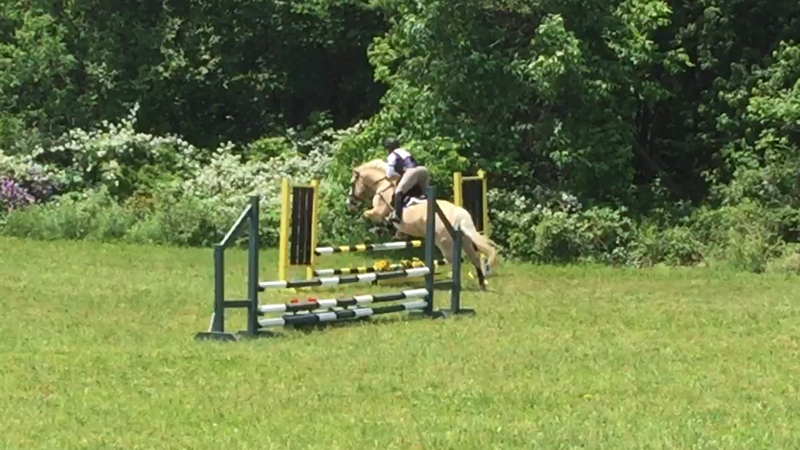 She even balance up enough to correct the cross canter landing off of jump 10. We trotted boldly out of the arena. For those who are curious, we kept the right lead from 6 to 7 for two reasons: 1. Forward and rhythm were the most important things I needed at that moment, and breaking to the trot accomplished neither of these. 2. May has a habit of throwing her right shoulder through me as an evasion. It is much more difficult for her to do that in a counter canter. It got her off my right leg for the turn to the diagonal line and helped keep her from falling in before the last jump. I will be honest here. I felt pretty defeated walking out of stadium. Before showing up at Kent, I had felt like our stadium is where we had made the most progress in the last month. May was learning to balance herself differently, and I was figuring out how to help her with that balance. So to have it all come crashing down at fence 3 (pretty much literally) was very disappointing. I have a really good horse, and I got that distinct, crushing feeling that I was ruining her. I think all riders (and especially Adult Amateurs) have this feeling at one point or another and having it at a show was not conducive to success on XC. Here’s the thing: this course had a (very small) down back, an up bank, related distances, an unflagged water crossing and a half ditch. The water has not gone well for us this year, and we haven’t done ditches/banks since the one time we schooled them last year. This, along with our less than confident SJ round, was not making me feel like we were set up for success. The course was long, and I knew my corgi would tire out. To put it bluntly, I was near tears. My trainer (at about 7 months pregnant) waddled up to me and asked if I was good. I shook my head and had trouble speaking. I told her about my concerns with the terrain questions and the length of the course. She told me that she can’t school me anymore. The only way to get the experience I need at this point is to go out and do it. She coached me on how to get May’s head in the game as they counted me down and off we went. The first jump was a blue house off of a turn. My trainer got a shot of it with her camera, but I apologize for the poor quality. Then we had a short gallop to a VERY steep hill. The hill had to be walked down, and May took her sweet time walking it. At the bottom of the hill was a few trot steps and the world’s smallest downbank. We cleared it without an issue then had a long canter stretch to the third jump. I realized that, with the time lost on the ditch, we kind of needed to boogie a bit. I let May pick up the pace, and just set her up a few strides before the third jump. The rest of the course went similarly. Set her up, jump the jump, make her go forward. The sixth jump was a red roll top that we shared with Novice. We had no issues with it and made the turn toward the up bank at a trot. May locked onto the blue log behind it and took me over the ditch and the log. We were going at a really good click as we approached jump 9, a hanging log with some brush over it that was about 5 strides from a stone wall. We jumped 9 and she fell through my left leg. I steered back to 10 and we took it at a bit of an angle, but it was clear. Jump 11 was a gray house before the woods. Then a few strides to a hedge jump (something we’ve never done), then a few more strides to a log-type jump. (Jump descriptions at BN are super boring) She sucked back at 11, so I rode her super forward to 12, giving up a good distance for a closer one because I didn’t trust her not to fall behind me leg if I used my hand at all. Jump 13 came up ok, but my mind was already on jump 14: the ditch. There were no less than 4 people sitting along the ditch jump. I trotted around the corner to make sure we were straight, but I didn’t need to worry. May saw the groundline and locked right onto the jump. She even locked on to the raised log after it. May did stop at the water, so I will have to devote some time to puddles in the near future. The last jump was a very plain, slightly raised log, that we barely even paused at. Overall, we came in 9 seconds under time with a clear round. I was so happy with her and so proud of myself for going through with it. At the end of the day, my friend and I exchanged the world’s most awkward congratulatory hug, and May and I finished in 7th out of 10. Without the penalties in Stadium, we would have been 2nd, which would have been really cool. As I reflected on the day with my fiance, I brought up how guilty I feel about the amount of time and money I spend on this sport when I get so upset about it, and I questioned why I do it. He reminded me of two things: 1. I love this sport. That includes my horse, the challenges, my friends, horse shows, late night rides, early rides, galloping, XC, and even Dressage. 2. My first lesson with May was a year ago, and she tried to run out of the arena with me. So what does it all mean? It means that on Sunday we have our next BN horse trial (and the last for a while) at Burgundy Hollow! (And then I am spending Memorial Day in bed).